With one of the world’s great natural harbours and rich mineral mines, Cartagena has been a prized location for millennia. The Carthaginians played a big role in its evolution as an ancient trading hub in the 3rd century BC before it was conquered by the Romans. You can purchase a multi-ticket to get access to Cartagena’s numerous Roman sites to understand the complicated ancient history of the city. In the 19th century there was a mining boom, bringing a lot of wealth to Cartagena and transforming the historic centre with art nouveau architecture. 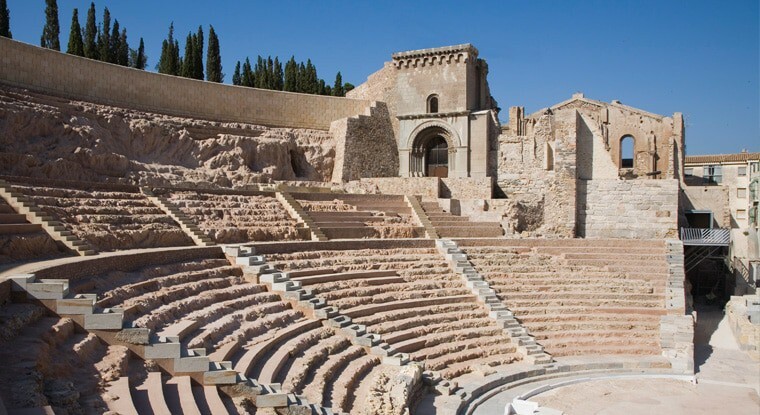 Of all the marvellous Roman landmarks in Cartagena, the 2,000 year-old theatre should be your first port of call. It’s fitting that this institution should be set in one of the western Mediterranean’s great ancient harbours, where new finds are made almost every year. ARQUA is a national centre for marine archaeology: A place to can see remarkable historical artefacts from underwater sites, but also a research facility for experts and scholars in the field. Find out how archaeologists analyse their discoveries at the laboratory area, which has interactive displays for kids. Among the many artefacts to check out are Carthaginian ivory tusks and the treasure of Nuestra Señora de las Mercedes, a frigate that was sunk in the early 19th century with 14.5 tons of gold and silver coins. In the late-1800s the mining industry made a handful of people very rich, and the most obvious expression of this wealth can be seen in the historic centre of Cartagena and nearby La Unión. Cartagena’s centre already needed rebuilding in the late-19th century, after a federalist insurrection in 1874 wiped out half the city. So towards the end of the century some gorgeous art nouveau buildings went up. 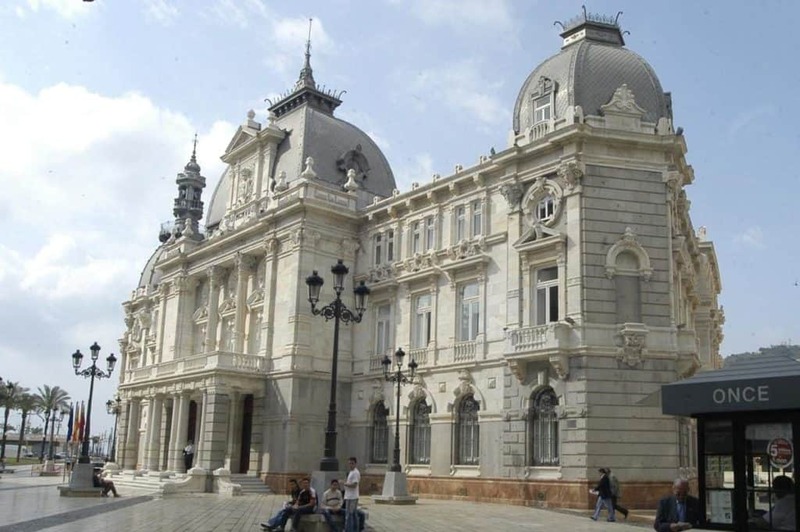 You could fit the best ones into a walking tour and they include the Palacio Pedreño, the Casino de Cartagena, the Casa Cervantes, the Palacio de Aguirre and the Gran Hotel. You can enter one of Cartagena’s most impressive modernist wonders, the 100 year-old town hall on Plaza del Ayuntamiento. This triangular palace was also a response to the mining boom in the late-19th century, as Cartagena had outgrown its former town hall. After suffering from structural problems in the 90s the building was restored to its Belle Époque glory days ten years ago. Take a few minutes to study the facade, composed entirely of white marble and topped with domes that are coated with local zinc. Get closer and you’ll even see a few bullet holes from the Civil War. There are English-speaking guided tours, showing you around the marble balustraded stairways and an exhibit of period tapestries. Furthest north of Cartagena’s ancient sites is a late-Roman necropolis, which was set on the shore of an ancient lagoon that has since disappeared. 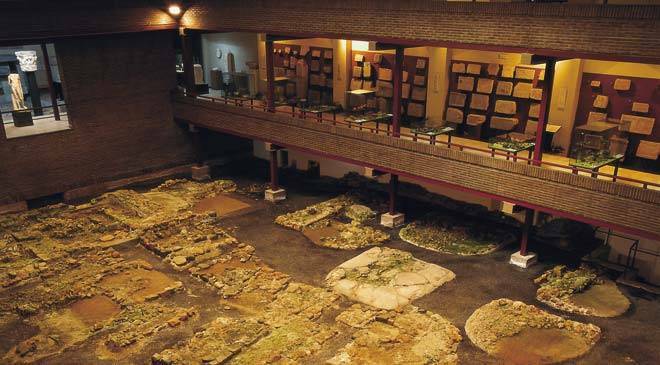 It’s an enthralling site, because it contains some of the latest evidence of Roman settlement, dating from 300 to 700AD – a time of transition to Christianity. The museum has plenty of items excavated from this site, but has also gathered a wealth of artefacts from around Cartagena. You’ll get a full chronology of the area, from Neanderthal remains, through Phoenician ceramics to the tools discovered in the Roman mines in the mountains on the edge of the city. Linking the Plaza de San Sebastián in the north with Cartagena’s town hall is a ravine-like pedestrian street paved with distinctive blue marble tiles. It’s a typically Spanish “Paseo”, where families and couples will take a stroll together or meet friends. The street is kept spotlessly clean and boasts many of Cartagena’s best modernist buildings. By day you can drop by for a cup of coffee or some high-street shopping, and in the evening you’ll be tempted by the various restaurants and tapas bars in this handsome location. An eerie time can be had at the tip of Cape Tiñoso, 30 minutes from Cartagena and reached via dirt roads. At 250 metres you’ll be able to gaze back at the extraordinary mountainous landscape of this natural park. But also here is an installation that mixes frivolous architecture with meaty and sinister artillery guns. 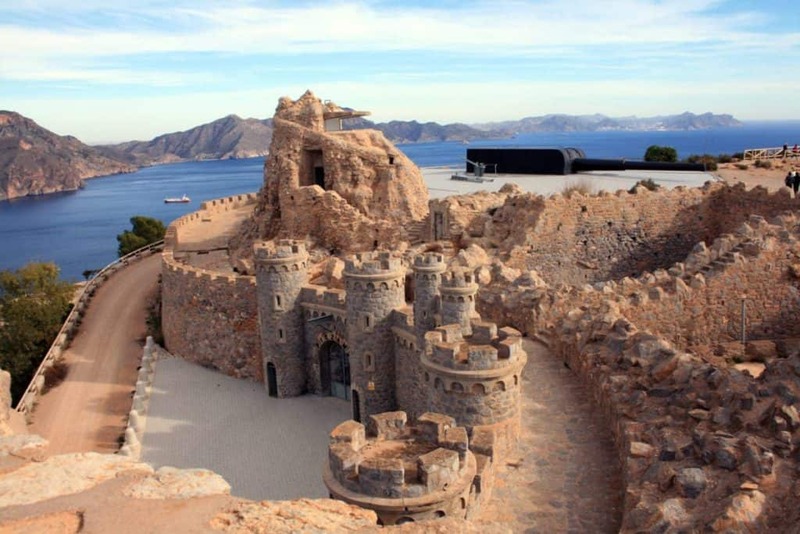 It was built in the mid-1930s during the rule of Primo de Rivera as part of a series of batteries defending Cartagena’s coast. Whimsical medieval-style turrets blend with the mountainside and look strange next to the menacing, black Vickers-Armstrong guns. Use the torch on your phone to investigate the tunnels in the fortified area. Cartagena has had a large military presence for thousands of years, and in modern times a number of Spanish army units have been based in the city. 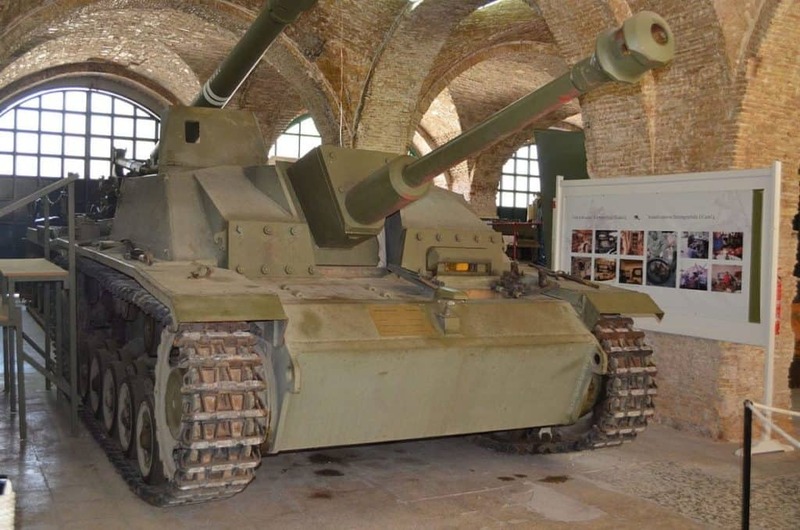 You can see a great deal of this heritage in one place, and it’s an attraction that will blow your mind if you’re into military hardware. The museum building was constructed in the late-18th century and in the courtyard you’ll spot an undetonated shell wedged in a wall from the insurrection in 1874. On show are tanks, missiles, field telescopes, light arms, a number of heavy-duty guns and all kinds of other military equipment. The museum also has the largest collection of hand-made military models in the world, with the Guinness certificate to prove it! The war from 1936-39 was one of the darkest moments in Spain’s history, and Cartagena didn’t escape the destruction. The city was a Republican military stronghold, and as you may have noticed it was well-defended from sea. This made it a target of bombing raids by the Nationalist forces (with help from the Nazis) so shelters like this one were built around the city. Down here you’ll appreciate what people had to do to survive, and will also see original signs, propaganda posters and other artefacts. There are moving first-hand accounts about the conflict, and you’ll learn of the ingenious ways the city attempted to trick the Nationalist forces into bombing the wrong locations. You’ve seen the necropolis, the theatre and the history of the port; now’s your chance to find out how Roman Cartagena’s wealthy citizens lived. This domus’ name comes from a Latin inscription on its back entrance: “Fortuna Propitia”, meaning “good luck” and it would have greeted all visitors. It’s easy to get a feel for the site as there’s so much of the walls and decoration remaining, as well as a stretch of the roman road outside. You can make out the hallway (atrium), bedrooms (cubiculum), dining hall (triclinium) and the owner’s office (tablinum). There are surprising features everywhere, including wall paintings and mosaic floors. Right on the port is this museum that covers Cartagena’s maritime military past. It’s in a dignified 18th century waterside building that until recently was a college for marine personnel joining Spain’s navy. The museum showcases memorabilia, weapons, navigational tools and offers detailed accounts of the turmoil on the 1870s. An absolute must is the Peral Submarine, the world’s first battery-powered underwater vessel, that was launched in 1888. This prototype was tested for two years but never developed, despite being a great technological step forward and possibly the world’s first “U-boat”. Cartagena had long been in decline by the time the Moors arrived in Spain. 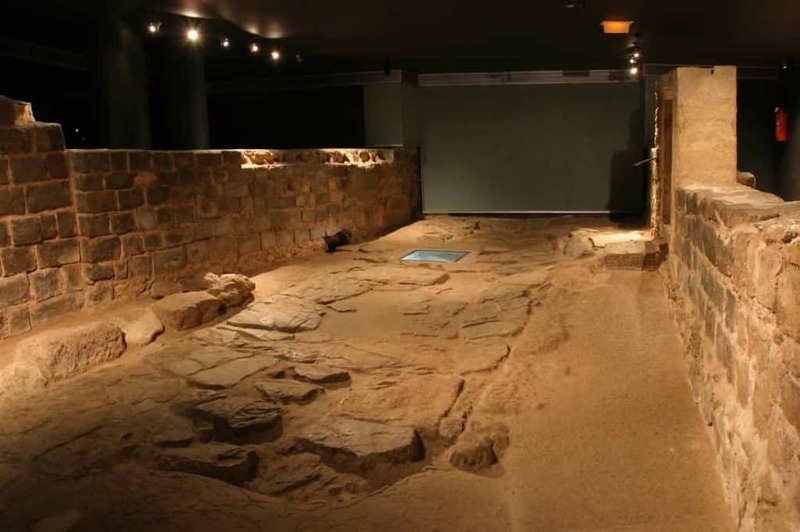 And for centuries it was believed that they hadn’t made their mark on the city at all, but excavation of the walls of this fortress in Parque Torres have shown that it was an Alcazaba, an Islamic fortified palace in the middle ages. Long before that it had been a Roman temple to Asklepio, and the cisterns from that time are still intact. Most of what remains now is from the 13th century, following the Christian “re-conquest”, with small pointers to this period visible in the carvings of eagles and rosettes. Catch the lift to the top for supreme panoramas of the harbour and coastal mountains. For a day of sun and sand you won’t regret going the extra mile to this unspoiled beach half an hour from Cartagena. Playa de Calblanque is on the road to Cabo de Palos, the headland at the southern end of La Manga. Take the exit for Calblanque and the road runs south towards the coast through farmland traced by the low arid mountains of the Calblanque Regional Park. Beyond these peaks is a secluded 300-metre beach with sands the shade of burnt gold. On quieter days you’ll have the beach almost to yourself, but don’t forget to bring refreshments as there’s hardly a sign of civilisation here. 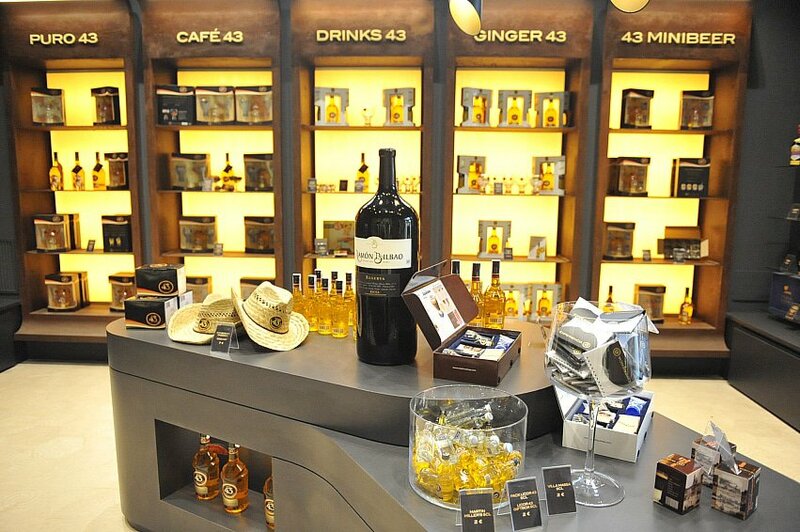 A grown-up rainy day option is a tour of one of Spain’s most-exported liqueurs, Licor 43, distilled right in Cartagena. Book ahead and you’ll take a two-hour trip around the facility, picking up loads of factoids from your multi-lingual guide. For the uninitiated, Licor 43 is a 31% abv spirit, made with 43 different citrus fruits and spices, and goes best with ice and milk. On the visit you’ll see the production process up close, from mixing to fermentation, ageing and bottling. Try to avoid being the designated driver, because the tour concludes with cocktails! As with many things in Cartagena mining was introduced to the area by the Romans. The Sierra Minera is rich with an assortment of metals including silver, copper, zinc, lead, tin, manganese and iron. Anyone who gets a kick out of industrial heritage will a closer look at the two mining attractions in the area: the La Unión Mining Park and the Las Matildes Mine. At La Unión the Agrupa Vicenta mine will blow you away; it plunges 80 metres beneath the surface and has huge, navelike spaces and an underwater lake with reddish waters. At both attractions you’ll see gear and infrastructure like miner’s quarters, compressor rooms, 19th-century derricks and carts for carrying minerals.